In what is claimed to be the first -of-its-kind surgery in the country and only the third in the world, doctors at a hospital treated a man suffering from a rare congenital heart condition of having five atrial chambers instead of four. 42-year-old Pali Devaram, who had been suffering from breathlessness and continuous coughing and heart pain, was diagnosed with the rare heart defect termed ‘Cortriatrium with Mitral Regurgitation’ after he underwent a medical check up at Medipulse Hospital here. “On diagnosis, we found him to be suffering from a rare congenital disease… We carried out some more tests in consultation with a cardiothoracic surgeon and found him to have five chambers in his heart instead of four,” the private hospital’s Cardiologist Alok Madan said. Madan said Cortriatrium is a defect where an additional membrane or a septum creates fifth chamber in the heart. After the final diagnosis, a team of doctors carried out a nearly four-hour-long surgery on Devaram on Wednesday. 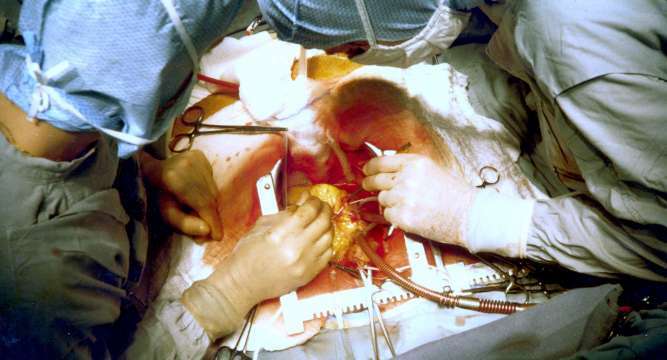 “We cut the membrane, which had created the wall above fourth valve thereby forming a fifth chamber and made it a four chambered heart, which is a normal heart,” Cardiothoracic surgeon Sanjeev Suresh Waidand said. Now, the patient would be able to lead a normal life as any other healthy person, he added. He said that the age of the patient and the severe Mitral Regurgitation made this surgery unique and rare, which costed about Rs 1.25 lakh to the patient. Patient’s relative Dinesh said they had visited many doctors and hospitals across the country but no one was able to diagnose the disease. “In last two months, Pali’s problems of breathlessness, constant coughing and heart pain had aggravated,” he said. The DEC members discussed the plan to transform Dubai into a global hub for health tourism as proposed by the Dubai Health Authority. The Dubai Executive Council (DEC) on Wednesday approved a plan to implement the strategy to turn Dubai into a world hub for medical tourism. A meeting of the council chaired by Shaikh Hamdan bin Mohammed bin Rashid Al Maktoum, Crown Prince of Dubai and Chairman of the Dubai Executive Council, also discussed a proposal to invest wisely the plots of land set aside for housing with the aim of earning sustainable profits to support the housing projects in the emirate and to give a backup to the government. The DEC members discussed the plan to transform Dubai into a global hub for health tourism as proposed by the Dubai Health Authority. According to the plan, Dubai would provide selected, distinctive and quality health services at competitive prices which would attract tourists visiting the emirate. The plan aims to build a system which would boost excellence in the field of healthcare, which would attract people willing to get curative services to the emirate of Dubai. The Dubai Health Authority has laid down a comprehensive strategy to achieve a number of investment targets in health tourism in six medical areas of specialisation, including dentistry, plastic surgery, ophthalmic surgery, general medical checkups, orthopedic surgery and sports medicine, in addition to recuperation and healing from skin diseases. The executive plan has been developed to include four main pillars: competition and prioritisation; Dubai’s global status; increasing the number of tourists and medical revenues through delivery of high-quality medical services; and achieving medical sustainability. The other proposals and projects discussed during the meeting included the investment of land allocated for housing to achieve a sustainable income to support housing projects and government’s support for these projects and providing sites for the delivery of public services near residential complexes that the Mohammed Bin Rashid Housing Establishment has embarked on constructing. Scientist have turned to Raman effect – named after Nobel Laureate Indian physicist C.V. Raman who discovered inelastic scattering of light 80 years ago – to solve complicated brain tumour surgeries. A research by the Innovation Institute at Henry Ford Hospital shows promise for developing a new method to clearly identify cancerous tissue during surgery on one of the most common and deadliest types of brain tumour. The findings offer improved outcome for those undergoing surgery to remove glioblastoma multiforme (GBM) – a tumour that attacks tissue around nerve cells in the brain. While some tumours have clearly defined edges, or margins, that differentiate it from normal brain tissue, GBM margins are diffuse, blending into healthy tissue. “This leaves neurosurgeons uncertain about successfully finding and removing the entire malignancy,” said neurosurgeon and lead author Steven N. Kalkanis. “Even with intensive treatment, including surgical removal of as much cancerous tissue as is currently possible combined with radiation and chemotherapy, the prognosis for GBM patients remains dismal,” he added. The researchers chose Raman spectroscopy, which measures scattered light to provide a wavelength ‘signature’ for the material being studied. It was only very recently that the processing technology was able to be condensed into a tiny space. The researchers decided to take full advantage of these advancements that lend themselves exceptionally well to a small, portable hand-held device, potentially yielding immediate results in real-time. “When developed, it would be the first of its kind in the world for this sort of brain tumour application,” said Kalkanis. With this method, the researchers were able to distinguish the three types of tissue with up to 99.5 per cent accuracy. Future studies would focus on methods of collecting and identifying Raman ‘signatures’ from tissue with freeze artefact, said the study appeared in the Journal of Neuro-Oncology. The conjoined twins, Saba and Farah in Bihar are said to be in critical condition and have been admitted to a leading hospital in Patna. Earlier this year, the Supreme Court had ordered the Bihar government to look after their medical expenses and provide all kinds of financial help to the family. The twins share a vital blood vessel in the brain. While Farah has two kidneys, Saba has none. The family of Saba and Farah were provided financial aid after they had rejected surgery to separate the two of them in the absence of funds. Dr Shyam Sundar, who has been treating the twins said that the twins have been facing complications from the past few days. “Farah has been bleeding from the nose from the past five days with some respiratory tract infection and the blood pressure of both the twins is low. We are still evaluating the cause of the bleeding and a multi speciality team is having a look”, he said. In case, an operation is being carried out to separate the head, it would prove to be a real medical challenge ,according to Doctor Sundar. Baby Roona, who had undergone a series of surgeries at a hospital here in few months ago for an oversized head, will undergo follow-up surgeries, doctors at a city hospital said on Saturday. The child of a daily wage labourer from Tripura, two-year-old Roona Begum is suffering from hydrocephalus, a rare disorder that has caused her head to swell to an unprecedented 94 cm. She was admitted to Gurgaon’s Fortis Memorial Research Institute here in April this year at the age of 18 months, where she underwent multiple complex procedures to get her head circumference reduced to 58 cm. “The five surgeries we performed earlier have not only helped the child survive a potentially fatal condition, but also enabled her to attain improved nutritional status and vitals. She has gained weight, is showing better neck control and is even making noises,” surgeon and director of neurosurgery in the hospital, Sandeep Vaishya, said. Fortis Foundation, the philanthropic arm of Fortis Healthcare Limited, continues to oversee the treatment of the child.